I am going to try to make the case that, all else being equal, monetary policy should be less accommodative–by which I mean that it should be willing to tolerate a larger forecast shortfall of the path of the unemployment rate from its full-employment level–when estimates of risk premiums in the bond market are abnormally low. These risk premiums include the term premium on Treasury securities, as well as the expected returns to investors from bearing the credit risk on, for example, corporate bonds and asset-backed securities. As an illustration, consider the period in the spring of 2013 when the 10-year Treasury yield was in the neighborhood of 1.60 percent and estimates of the term premium were around negative 80 basis points. Applied to this period, my approach would suggest a lesser willingness to use large-scale asset purchases to push yields down even further, as compared with a scenario in which term premiums were not so low. Mr Stein is effectively taking ownership of the Fed’s move toward tapering. Long-term unemployed Americans should address their letters accordingly. Not content in reasoning from a price change, some also reason from a quantity change! Hopes for an American export boom are wilting under the weight of a strong dollar and global economic strains. U.S. exports are on track to decline this year for the first time since the financial crisis, undermining a national push to boost shipments abroad. Through July, exports of goods and services were down 3.5% compared with the same period last year. New data released Tuesday by the Commerce Department showed that exports of U.S. goods sank a seasonally adjusted 3.2% in August to their lowest level in years. The weak trade performance is restraining overall economic growth, a sign of how troubles in China and other major economies are dinging the U.S. economy. “Foreign demand remains the weakest part of the economy,” said Jim O’Sullivan, chief U.S. economist at consulting firm High Frequency Economics. But the dream of an export boom has faded. As unemployment has declined, American consumers have reasserted their dominant role in driving economic growth. And a strong dollar and weakness overseas have helped turn international trade into a drain on overall economic growth in four of the past six quarters. Why not realize that it´s overall spending growth fall that is restraining economic growth? Consumer spending is almost 70% of aggregate spending. Therefore, the role of the consumer has always been “dominant”. As the chart indicates, NGDP growth has fallen together with the growth in consumer spending, implying the consumer has had a dominant role in driving economic growth down! The US last week showed its first signs of deflation for 55 years, prompting inevitable fears of further deflation in the future. Yet the primary reason for the negative rate of US inflation is the dramatic 30 per cent fall of commodity prices. That will not happen again [what certainty]. Moreover, excluding food and energy, consumer prices are up 1.8 per cent from a year ago. That is the good news: the outlook for the longer term is more ominous. The current inflation picture is more confusing. The annual (PCE)headline rate over the past 12 months was only 0.2% 0.3%, far short of the Fed’s 2% target. This reflected the dramatic fall in energy prices during the previous year, with the energy component of the consumer Personal Consumption Expenditure (PCE) price index down 13%. The rate of so-called (PCE)core inflation (which excludes energy purchases) was 1.8% 1.3%. Even that understates the impact of energy on measured inflation, because lower gasoline prices reduce shipping costs, lowering a wide range of prices. The point is simple: When energy prices stop falling, the overall price index will rise close to 2%. And the FOMC members’ own median forecast puts inflation at 1.8% in 2017 and 2% in 2018. Notice that low inflation is always due to commodity/oil prices and that will end! How can a Harvard professor be hooked in reasoning from a price change I´ll never fathom! He´s not alone because that´s exactly what´s going on with a bunch of FOMC members also. “When energy prices stop falling, the overall price index will rise close to 2%”. Not true. In the two years prior to the tumble in oil prices, the price of oil was high and relatively stable. 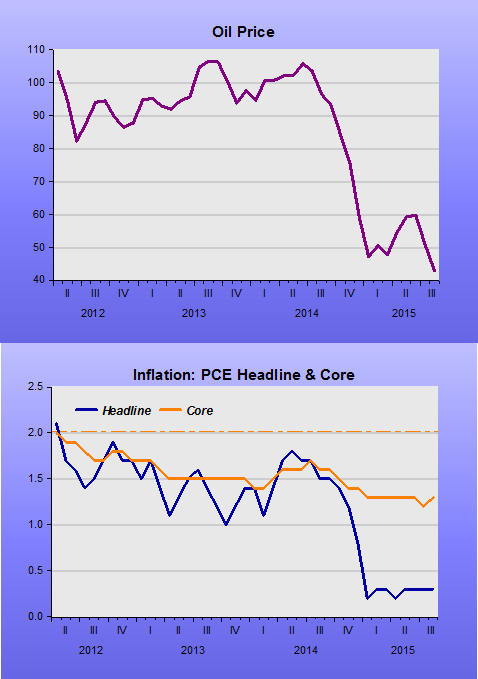 Nevertheless, inflation, both the headline and core PCE were gently falling! What´s behind the fall in oil/commodity prices and the rise in the dollar over the past year or so is the downtrend in NGDP growth. And that results from FOMC tightening. No need to increase rates, talk of “tightening” is sufficient to get the job done! What really shocked the markets was not the Fed’s decision to maintain zero interest rates for a few more months, but the statement that accompanied it. The Fed revealed that it was entirely unconcerned about the risks of higher inflation and was eager to push unemployment below what most economists regard as its “natural” rate of around 5%. It is this relationship – between inflation and unemployment – that lies at the heart of all controversies about monetary policy and central banking. And almost all modern economic models, including those used by the Fed, are based on the monetarist theory of interest rates(!) pioneered by Milton Friedman in his 1967 presidential address to the American Economic Association. The monetarist theory that justified narrowing central banks’ responsibilities to inflation targeting had very little empirical backing when Friedman proposed it(!). Since then, it has been refuted(!) both by political experience and statistical testing. Monetary policy, far from being dissipated in rising prices, as the theory predicted, turned out to have a much greater impact on unemployment than on inflation, especially in the past 20 years. But, despite empirical refutation, the ideological attractiveness of monetarism, supported by the supposed authority of “rational” expectations, proved overwhelming. As a result, the purely inflation-oriented approach to monetary policy gained total dominance in both central banking and academic economics. But there may be a deeper reason for the Fed’s forbearance. To judge by Yellen’s recent speeches, the Fed may no longer believe in any version of the “natural” unemployment rate. Friedman’s assumptions of ever-accelerating inflation and irrationally “rational” expectations that lead to single-minded targeting of price stability remain embedded in official economic models like some Biblical creation myth. But the Fed, along with almost all other central banks, appears to have lost faith in that story. Instead, central bankers now seem to be implicitly (and perhaps even unconsciously) returning to pre-monetarist views: tradeoffs between inflation and unemployment are real and can last for many years. Monetary policy should gradually recalibrate the balance between these two economic indicators as the business cycle proceeds. When inflation is low, the top priority should be to reduce unemployment to the lowest possible level; and there is no compelling reason for monetary policy to restrain job creation or GDP growth until excessive inflation becomes an imminent danger.The bad news is that the vast majority of market analysts, still clinging to the old monetarist framework, will accuse the Fed of “falling behind the curve” by letting US unemployment decline too far and failing to anticipate the threat of rising inflation. The Fed should simply ignore such atavistic protests, as it rightly did last week. The monetary authority controls nominal quantities-directly, the quantity of its own liabilities. In principle, it can use this control to peg a nominal quantity-an exchange rate, the price level, the nominal level of national income, the quantity of money by one or another definition-or to peg the rate of change in a nominal quantity-the rate of inflation or deflation, the rate of growth or decline in nominal national income, the rate of growth of the quantity of money. It cannot use its control over nominal quantities to peg a real quantity-the real rate of interest, the rate of unemployment, the level of real national income, the real quantity of money, the rate of growth of real national income, or the rate of growth of the real quantity of money. As an empirical matter, low interest rates are a sign that monetary policy has been tight-in the sense that the quantity of money has grown slowly; high interest rates are a sign that monetary policy has been easy-in the sense that the quantity of money has grown rapidly. The broadest facts of experience run in precisely the opposite direction from that which the financial community and academic economists have all generally taken for granted. Monetary policy cannot peg these real magnitudes at predetermined levels. But monetary policy can and does have important effects on these real magnitudes. The one is in no way inconsistent with the other. The first and most important lesson that history teaches about what monetary policy can do-and it is a lesson of the most profound importance-is that monetary policy can prevent money itself from being a major source of economic disturbance. The first requirement is that the monetary authority should guide itself by magnitudes that it can control, not by ones that it cannot control. If, as the authority has often done, it takes interest rates or the current unemployment percentage as the immediate criterion of policy, it will be like a space vehicle that has taken a fix on the wrong star. No matter how sensitive and sophisticated its guiding apparatus, the space vehicle will go astray. And so will the monetary authority. Watching the recording of NY Fed Dudley’s market-moving live interview with the WSJ yesterday morning reminded me of a man caught in a trap. When his interviewer, Jon Hilsenrath, rather melodramatically paused the interview after Dudley, a well-known dove, repeated the mantra about a likely rate rise before the end of 2015 the NY Fed chief looked quite alarmed. The weirdest thing he said was that the US was “growing above trend”. If he really believes that it would be good to see some evidence. He didn’t bring up above trend growth in his June 2015 interview with the FT. So it is a new concern that he thinks growth is above trend now. Perhaps he was just thinking of the upwardly revised 3.7% annualised growth 2q15/1q15 versus the (also upwardly revised) 0.6% annualised growth 1q15/4q14. If so, this seems incredibly short term and far too reliant on noisy qoq annualised growth rates – and certainly ignores falling NGDP growth. Clearly, he was uncomfortable having to toe the line of his boss, Janet Yellen, who seems keenest on a 2015 rate increase. It didn’t look like he really believed in the rise but was simply being loyal. Admirable, but misguided. He should be his own man, but then if he was his own man he’d probably never have been appointed by the NY money-center banks to head the NY Fed. The biggest issue was his constant refrain that he and the FOMC were “data dependent”. That they weren’t trapped by a calendar commitment to anything. But one of the data points that the FOMC talks up is financial market data. This presents a problem in the current environment of a threatened rate rise. The global economy is slowing, partly due to most of the non-US world having tied itself to US monetary policy, and the US economy is OK but not great. The markets recognise this troubling situation and so increasingly focus on the Fed’s monetary policy stance. And with the active tightening bias this causes more financial market turmoil, highlighted in real time during his interview. And so the financial data becomes worse, for a “data dependent” Fed. The circularity of this seems to be lost on the FOMC. Dudley and the FOMC seem to think of themselves as observers half of the time rather than participants. It is a vicious circle, but one that could be broken out of if the Fed were to target NGDP growth expectations instead – with an allowance for going over the target if there is some undershooting of the target in practice. Obviously, the circle may not be quite so swiftly vicious if the FOMC really do keep to their data dependency, as financial markets will not let them actively tighten. That said, the slow strangulation will continue, and if the rest of the world has a crisis that does then infect US demand, then the FOMC will have to re-start QE or move to negative interest rates, things they seem really loathe to do – in the absence of altering the target of monetary policy to a much better monetary aggregate like NGDP. That´s the ‘dot plot’, conceived by the “Transparency Committee” headed by Janet Yellen while a Governor at the Board. Interestingly it came ‘on line’ for the first time in January 2012 at the same time inflation hit the target. Since then inflation has mostly trended down. It has done so even while oil prices remained high. 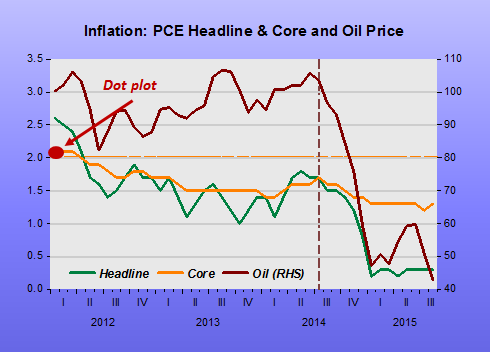 Naturally, when oil prices tumbled in mid-2014, headline inflation followed suit. However, by the time the first dot plot was released in January 2012, the Fed was no longer expecting to chart an exit from stimulus soon. The economy had taken a turn for the worse; in fact, additional bond-buying was on the horizon. Then-Fed Chairman Ben Bernanke consequently downplayed the dots, a tradition that Janet Yellen continued when she assumed leadership of the Fed at the beginning of last year. At times, the chart—with its 17 disparate projections of the future path of policy—can conflict with the unified message the committee is trying to send. Over the last several quarters, however, the dots have come back down, suiting Yellen’s message that the pace of tightening to follow what would be the Fed’s first rate increase in nearly a decade will be gradual. So Yellen has turned back to the dots as “Exhibit A” for investors. During her press conference in June of this year, she pointed to it repeatedly when asked about the central bank’s likely course. “From my perspective, at this moment, the decision to begin the normalization process at the September FOMC meeting seems less compelling to me than it was a few weeks ago,” Dudley told a news conference Wednesday at the New York Fed. I really do hope that we can raise interest rates this year, because that would be a sign that the U.S. economic outlook is good and that we’re actually on track to achieve our dual mandate objective,” Dudley said. Federal Reserve Bank of New York President William C. Dudley said the central bank will “probably” raise interest rates later this year despite uncertainties over global growth. Unemployment in the U.S. has fallen to its lowest level in more than seven years, making it harder for the Fed to justify interest rates near zero. Inflation, however, has remained well below the Fed’s target. It was 0.3 percent in the 12 months through August, as measured by the Fed’s preferred gauge of price movements. Which completely misses the logic that “you’re not really seeing the impact of policy end up in inflation” exactly because monetary policy has been anything BUT accommodative! “I know you think you understand what you thought I said but I’m not sure you realize that what you heard is not what I meant”. Forget interest rates as providing the stance of monetary policy, and look instead at NGDP growth and inflation (remembering that the rising dollar and falling commodity and oil prices are consequences or symptoms of monetary tightening). Despite some promising progress of late why is that Market Monetarism hasn’t been more widely adopted? Perhaps it’s just patient debate that’s needed. There always seems there´s a psychological step to get over before the penny drops on the idea. The answer turns on the role or power of expectations. Krugman’s desire for the central bank to be irresponsible, to threaten to print, or to actually print as much new money as will really scare people into actually believing that the central bank is irresponsible. Market Monetarists don’t like this irresponsible notion of a central bank, they merely want it to set the right target and promise or threaten to use all means to meet it. The target itself should be a responsible one, like 5% NGDP (Forecast) Growth. And then the central bank policy will also be responsible. But what about the mechanism that makes people actually change their behaviour so the central bank can see a change, a move towards its target, when an economy is operating below trend nominal income (NGDP) growth. The core is the well-known “hot potato effect“. People have to believe that the central bank money creation will lead to money being devalued, and so it has to be spent sooner than otherwise as prices of real goods, services and assets rise. This creates more spending out of nothing, raises nominal demand, and enables the economy to escape from any putative liquidity trap, or monetary strangulation. The question is why don’t more economists advocate using this very basic economic theory, or central banks really work with it? Instead, central banks have gone out of their way to neutralise the new money they have created by introducing IOER or constantly reiterating that their inflation targets are sacrosanct. It is almost as if the central banks fear this hot potato effect, and have turned it into more of a “hot potato monster”. The moment the newly baked potatoes are taken out of the oven central bankers seem to fear a contagious outbreak of mad behaviour that could tip economies into out of control hyperinflation that will only be remedied with sharp rises in interest rates. Listening to Janet Yellen at the September FOMC press conference and in her recent speech these fears seem to play a huge part in her thinking. ” …… if we maintain a highly accommodative monetary policy for a very long time from here and the economy performs as we expect … and the risks that are out there don’t materialise … [my concern [is] much more tightening in labour markets … lags will be probably slow, but eventually we will find ourselves with a substantial overshoot of our inflation objectives … forced into a kind of stop-go … we will have pushed the economy too far it will become overheated … instead of slow, steady growth … not good policy to slam on the brakes and risk a downturn in the economy …”. 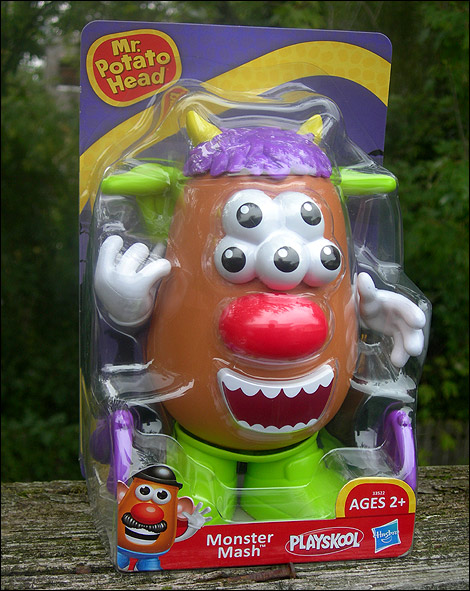 Yellen’s “substantial overshoot” is the hot potato monster. It seems a psychological problem she and her central bankers have rather than something based on reason. Yet the hot potato is also her friend and the main tool for monetary policy. It needs to become a hot potato sheep dog (apologies for mixing the metaphors), nipping, barking and driving the sheep backwards and forwards when necessary, at other times just watching, lying low. When the sheep need to move the dog springs into action and gets the velocity up. 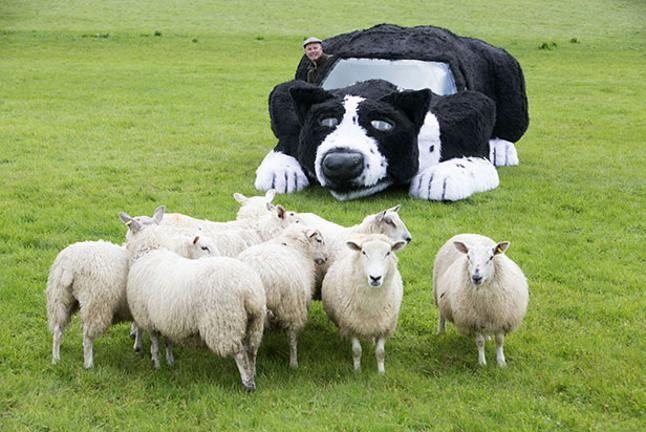 A really good sheep dog does very little indeed. The sheep remain calm. The Fed is a bit like a not very good sheep dog at the moment, not a wild one like in 2008 running in all directions causing chaos, just a poor one. I’m not sure what the analogy is to too low velocity: sheep dogs can actually kill sheep if they are not well trained. Formal model-obsessed macro-economists inside and outside the central banks don’t help as they can’t compute how hot to take bake the potatoes (interest rates) or how many to bake (QE). The heat and quantity of the potatoes necessary can’t be easily gauged except in the outcome. The outcome is nominal growth expectations, but the macroeconomic conditions in which those expectations are formed are constantly changing dependent on all the usual AS and AD issues like confidence, war, politics, investment cycles, etc, etc. The great insight of Market Monetarism is that you can control the hot potato more or less precisely because you can set the controls of the potato oven to the market’s expectations for nominal growth, or growth in aggregate demand. Or rather, act like a sheep dog, keeping its flock calm and on track, through expectations. Maintaining zero interest rates for so long is creating a scenario in which containing risks “becomes virtually impossible,” according to an analysis from a former Fed official. A “muddled mandate” has the Fed too focused on unemployment at the expense of price stability, wrote Athanasios Orphanides, a global economics professor at the Massachusetts Institute of Technology’s Sloan School of Management. Former Fed boards knew enough to begin raising rates after long periods of accommodation well before the economy hit the full, or “natural,” unemployment rate, said Orphanides, a respected former senior Fed advisor and member of both the European Central Bank and Central Bank of Cyprus. The paper outlining his views appeared on the St. Louis Fed website and is based on a June speech he gave to that branch of the U.S. central bank. In the analysis, he paints a grim scenario should the Fed not choose to start hiking rates soon, calling the current scenario “the case of the missing liftoff.” The unemployment rate, currently at 5.1 percent, equals the 5.5 percent rate that the Congressional Budget Office considered full employment back in February, signaling the Federal Open Market Committee is well behind when previous Feds chose to begin raising rates, he said. To get past the policy confusion, Orphanides recommends the approach that previous Feds followed, particularly after recessions in 1981, 1990 and 2001. The problem is that they keep calling “unprecedented monetary accommodation” when, in reality, what we´ve seen is “unprecedented monetary stinginess”! As Friedman said long ago and Bernanke repeated 12 years ago, interest rates do NOT indicate the stance of monetary policy, for that you have to look at things like NGDP growth and inflation! The charts shows what reasonable (not great) monetary policy was after two of the periods Orphanides mentions. This time, with NGDP growth so “stably” low, there´s no chance of a sustained pick-up in inflation! But as the first sentence above makes clear, Orphanides, like former Governor Jeremy Stein, is worried about “containing risks” and also like J Stein thinks interest rates “gets in all the cracks”! The dates of the Plaza and the Louvre meetings are marked in the chart. Observe how the move toward an excessively restrictive policy starts at the time of the Plaza meeting. Indeed, as chart shows, the Bank of Japan increased its policy rate by a large amount immediately following the Plaza meeting, which was in the opposite direction to what macroeconomic fundamentals of inflation and output were indicating. Then, after a year and a half, starting around the time of the Louvre Accord, Japanese monetary policy swung sharply in the other direction—toward excessive expansion. The chart is remarkably clear about this move. 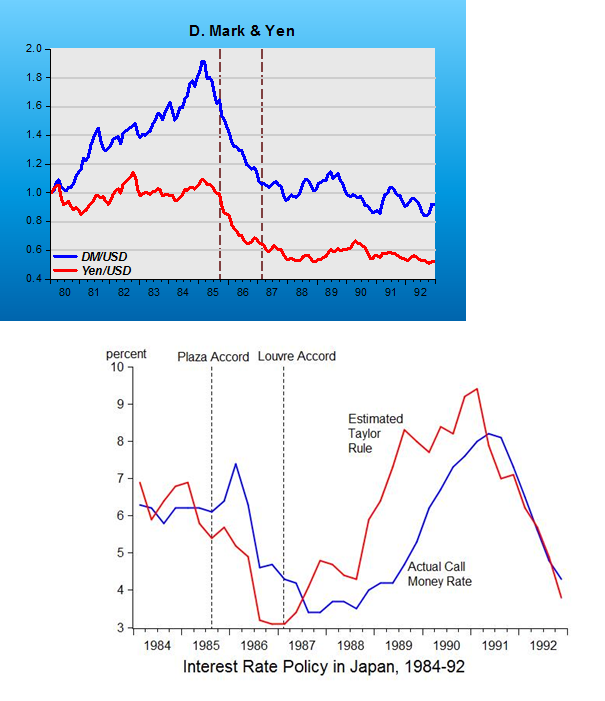 The policy interest rate swung from being up to 2¼ percentage points too high between the Plaza and the Louvre Accord to being up to 3½ percentage points too low during the period of time from the Louvre Accord to1990. And God forbid what would have happened to the Japanese economy if between 1987 and 1990 the BoJ had followed the “Taylor-rule”! 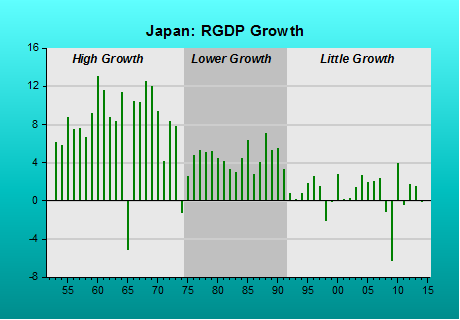 As we now know, that was the time that Japanese NGDP flattened out and Japanese real growth all but disappeared! The fact is that Japan could never let the yen depreciate relative to the dollar. It could and should appreciate! The initial rise in the BoJ´s call rate was to make sure that happened. It´s a simple story of failure, but one that fits the facts. It´s also based on a simple premise: An inflation obsession that took hold in 1974. It´s also a story that gives credence to Market Monetarists’ recommendation that central banks should level target NGDP. It teaches us Abe´s latest move is one that goes in the right direction. The story is told through 3 charts. The trigger of the process that defined the Japanese economy was the domestic inflationary impact of the first oil shock. Inflation in 1974 climbed above 20% and worries about inflation and its effects on the real economy, including the worst bout of labor unrest since the war, quickly turned price stability into a priority of economic policy. More than a “priority”, price stability became an “obsession”. This is consistent with the reaction to the introduction of the consumption tax (CT) in 1989 and the CT increase in 1997. We should put “price stability” in scare quotes too. The Fed and other central banks increasingly seem happy to interpret this as zero inflation is acceptable, but anything over 2% a precursor to hyperinflation at worst and a return to stop-go monetary policy chaos at best. 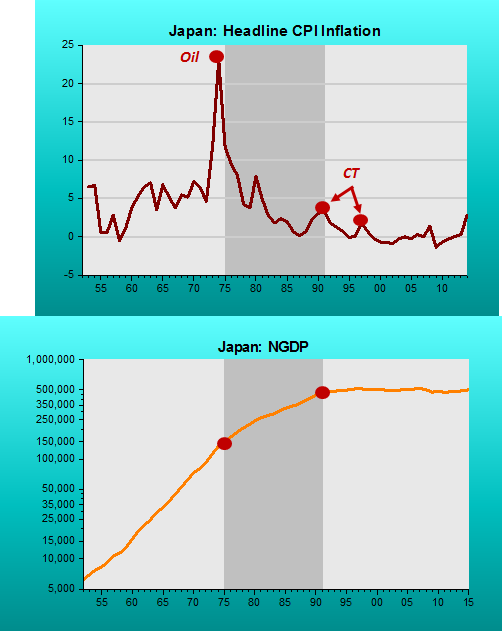 What central bankers should recognize are that labor unrest and consumption taxes are supply shocks and the best the BoJ could have done was keep NGDP on the level path it had been on since the early 50s. The BoJ monomania on price stability led to them wanting to “eradicate” inflation, not keep it in the 0% – 5% range that held in the 20 years before the oil shock. 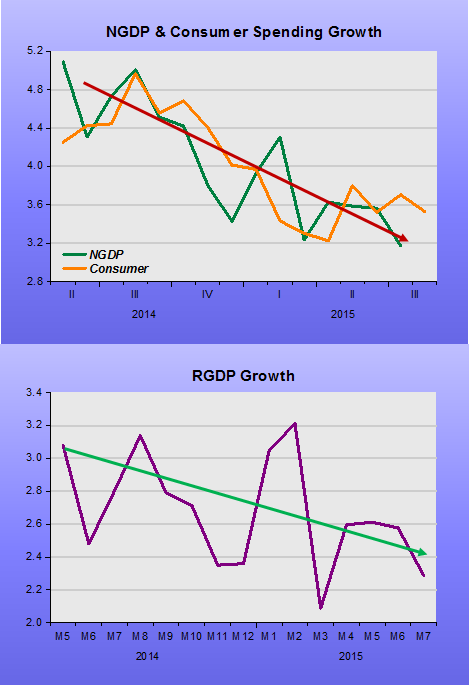 To do that, the BoJ strongly reduced the trend growth of NGDP. Did they think that crushing inflation would somehow teach labor a lesson? Perhaps. The new trend held until 1990, when the “tax shock” gave a very short term uptick to inflation. 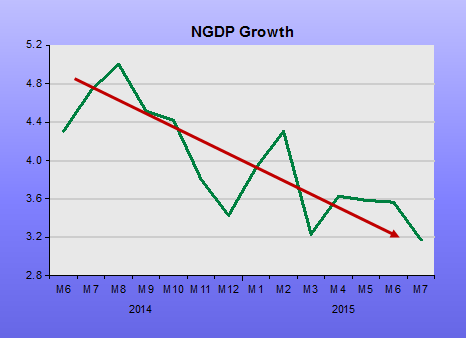 Thereafter NGDP trend growth has remained close to zero. Competent central banks should stay loyal to long-term inflation expectations, but seem unable to do so only when headline inflation (even if due to CT increases) is above target. If headline or even core inflation is below target they all too easily fall back on those long term, well-anchored, expectations to justify doing nothing, or worse and tightening. The BoJ´s goal of price stability (“zero” inflation) was attained, but real growth all but disappeared as monetary strangulation took place. Abenomics, introduced with the election of Abe in late 2012, has improved things somewhat but it´s still tied the self-defeating inflation target (not “zero” but 2%), and as the recent experience of many developed countries with targets for inflation has shown, you can easily get into a “stagnation trap”! Japan was the first country to (implicitly) pursue an inflation target. Now it looks on the verge of being the first to pursue an (explicit) NGDP level target. Maybe it will not take as long for present day inflation targeting countries to follow suit. Who said there´s no irony in economic policy! A target for nominal GDP (or the sum of all money earned in an economy each year, before accounting for inflation) is less radical than it sounds. It was a plausible alternative when inflation targets became common in the 1990s. A target for NGDP growth (ie, growth in cash income) copes better with cheap imports, which boost growth, but depress prices, pulling today’s central banks in two directions at once. Nominal income is also more important to debtors’ economic health than either inflation or growth, because debts are fixed in cash terms.